The tomato plant (Solanum lycopersicum) is a common element in many backyard gardens and can create an abundant harvest of crimson fruit that's perfect for salads, soups and other dishes. With proper watering, feeding and general care, you can help improve the fruit yield of your tomato plant to boost your garden's productivity and get more out of each of your plants. Start growing your tomato plants when the outdoor air and soil temperatures are at least 60 degrees F or you'll have stunted plants, and thereby reduced fruit production. If you're planting your tomatoes from seed, the ideal soil temperature for healthy seed germination is 68 degrees F, according to the University of California Vegetable Research Center. Give your tomatoes sufficient light so the plants can achieve their full growth and yield potential. If your vegetable plot receives less than seven hours of direct sunlight per day, consider moving your garden area. Water your tomato plants. 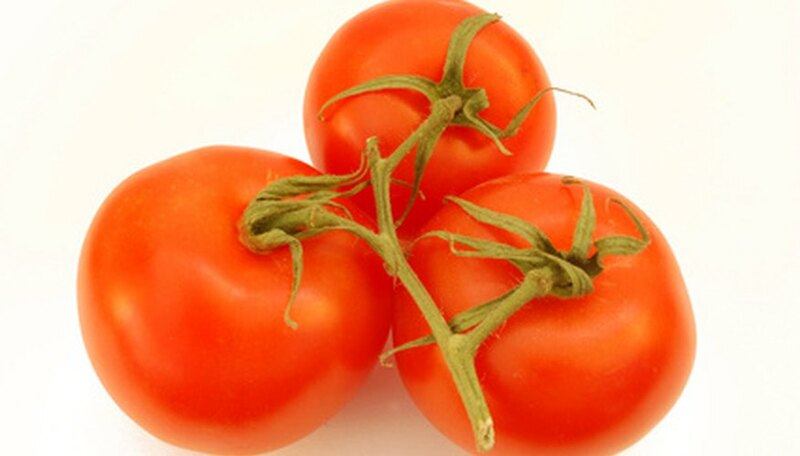 Water constitutes most of the tomato fruit's content, and poor watering will cause small fruits or lowered fruit yield. Provide each tomato plant with about 64 oz. of water daily until the plant starts producing fruit, after which you should supply 96 to 128 oz. of water. Feed the tomato plants with a vegetable fertilizer that's low in nitrogen--nitrogen lowers yield and increases foliage--and high in phosphorous. This can help boost and sustain fruit production. Example nutrient ratios include 6-24-24 and 8-32-16 fertilizers. Apply the fertilizer according to the product's label, since potency varies by product. Water the plant after fertilizing it to help carry the nutrients to the root level. Stake your tomato plants. This improves yield and the quality of your tomatoes, and also makes them less likely to contract diseases, according to the University of Minnesota. Pound a 60-inch pole or wood stake 4 to 5 inches into the ground approximately 4 inches from the tomato plant. Tie the plant's main trunk to the stake with string or garden twine. A 2- to 3-inch thick layer of mulch around the base of your tomato plant can help conserve soil moisture. Your tomato plant's fruit production and quality will drop considerably if the temperatures in which the plant is grown reach higher than 95 degrees F. Its yield will also drop if the daily temperature is lower than 68 degrees F in the day, and less than 50 degrees F at night, according to the University of California Vegetable Research Center.